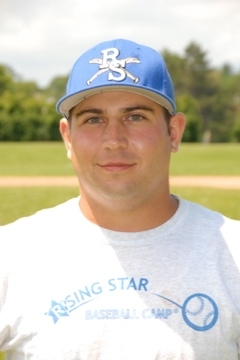 Coach LaPadula was a camper at Rising Star Baseball Camp during summers 1999-2001. In 2008, Coach LaPadula took an assistant coaching position at New Rochelle HS. He is also the head baseball coach for the New Rochelle Braves 16U Travel Team. Having been a starting infielder at NRHS that compiled a .455 on base percentage, Coach LaPadula helped lead his team to the Section One quarterfinals in 2004. He went on to attend and study history at Temple University. Currently, Coach LaPadula is a certified Social Studies teacher at Ossining High School. Coach LaPadula's duties at camp include, teaching base running and infield defense. He is well known for his challenging baseball trivia and game situations questions. Since 2012, Coach LaPadula has assumed the role of Field Director on the Double A Field.